Lot 9679C, Desa Aman, Batu 11, Sungai Buloh, 47000 Selangor, Malaysia. EOE Enterprise Sdn Bhd was established in the year 2000, and it has been involved in trading of fabrication of advertising more than 5 years in the market. EOE Enterprise Sdn Bhd is well known for its good quality finishing, reliability and timely delivery of projects which it undertakes within the industry. Over the years, EOE Enterprise Sdn Bhd has managed to expand its networking internally. 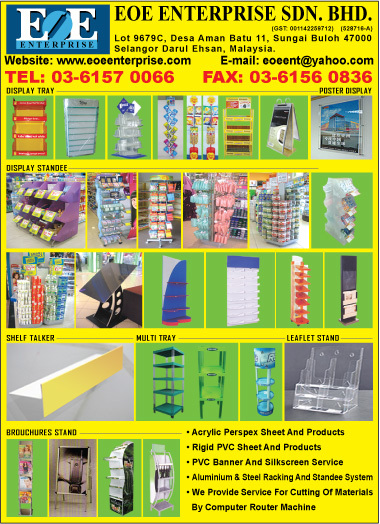 Our business activity and service includes of 3 dimensional signage, thermoforming of plastic, display racks, promotional standee, computer router cut, graphic design and printing of below the line advertising, also customize display shelf upon specific requirement. Our ultimate goal is to further equip ourselves with complete range of signage supplies. We also carry quality signage Adhesive Vinyl Stickers and other advertising material accordingly to our customer's creative design.